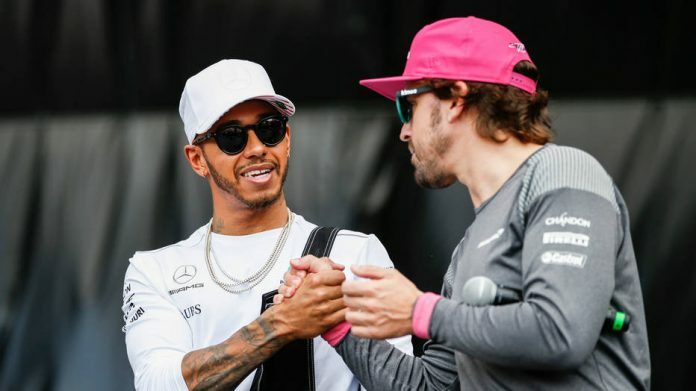 AUSTIN: Fernando Alonso heaped praise on Lewis Hamilton and omitted Sebastian Vettel on Thursday when he was asked to name his five greatest Formula One drivers of all time. Speaking at a news conference ahead of this weekend’s United States Grand Prix, the two-time world champion Spaniard said that Hamilton had proved his talent by winning in cars that were not expected to be victorious. “If one (driver) had to do that in our generation, I am happy it is Lewis as he has showed the talent and commitment. When the car is dominating, then he delivers — and when it is not good enough to win a world championship, he still puts in the performance to show his talent. Hamilton needs to outscore Vettel, a fellow-four-time champion, by eight points in Sunday’s race to clinch his fifth title, but he avoided all talk of any glory that may ahead. Alonso spoke twice in glowing terms of Hamilton’s raw talent and speed, the pair having been McLaren team-mates in 2007 when the Briton entered Formula One. “Thank you,” said Hamilton, softly, after his first response. “This would probably be the top five for me,” he said. Hamilton spoke of both Fangio and Vettel as he responded to questions. He also explained why he had recently defended and supported the luckless, under-fire Vettel, with a social media post on Instagram, following his and Ferrari’s recent slump in form. “I think if I was in the same position they would do the same thing,” he said. “As drivers, we are all members of the GPDA (Grand Prix Drivers’ Association) and I think we all need to stick together. “And I think the respect that we have for one other is the best that it has been for many years, at least in the years that I’ve been in Formula One.